Today I want to provide you some information and coparenting tips to help your divorce go as smoothly as possible. No one goes into having children with a partner thinking they will later split up as a couple and be a single parent. A couple who bring a child into the world usually do so in love, hope for the future and with a lot of planning. So, it can be an unexpected twist in life when the relationship falls apart. The one thing that most parents have to remember is that even in the event you fall out of love with each other, your children are still your children and you don’t want them to suffer from the fall out of your relationship. A divorce is not an easy process, especially when there are children involved. But with these coparenting tips you can have smoother sailing. Coparenting is a way of relating and raising children when your relationship breaks down. Coparenting requires a very keen skill-set as well as an appropriate mind-set. While it is not easy to do, the couples that manage to coparent successfully will see their children benefit in being able to continue to have health relationships with both parents. I have worked with many families over the years in my practice as a professional counselor with the process of coparenting and focusing on the best interest of the child. I’m happy to provide resources on how parents can have a successful coparenting relationship. When a couple has extremely high levels of conflict with intractable dynamics coparenting may not be optimal or even possible. In those cases, a parallel parenting plan is a better option. But whenever possible I like to help parents get to a place where they are able to work together for the sake of their child. Collaborative divorce is one route to moving through the divorce in such a way the best interest of everyone including the children is considered without all the conflict. Collaborative divorce addresses the legal, financial, emotional and parenting components of the divorce process with a team of professionals. Divorce does not need to involve a court process. Kelley Linn runs an amazing and unique center in the metro Atlanta area to support couples and families through the divorce process through a unique mediation process. 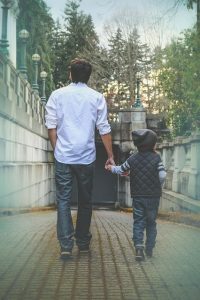 If you are interested in starting the mediation process directly with an attorney, you can explore how to find a divorce mediator near you or try DicksonLegal.com for more information on how to go about it. Keep an open dialogue with your ex. It’s not always easy to do, but when there are children are concerned it’s best if you can both agree on the same rules. Parents who play against each other do not raise secure children. Keep a tight ship. Whatever the rules are in one house ideally should align with those in the other house or your children may be confused and may play you against one another. Security and predictability are both important for children. Talk positively about each other around the children. Don’t forget; your child is the child of both of you. Insulting one parent is, by proxy, insulting the child who is half that parent. Update each other often on your whereabouts when the child is with you but keep some boundaries in place. You’re moving on with your life apart from one another and you need appropriate emotional distance from you ex. Pick your battles with your ex. Don’t make a big deal over every little conflict of parenting opinion. And when you do need to address an issue, be business-like, respectful and nix name-calling, skip the lectures and drop all emotional rhetoric. Send a photo you take of your child at a special event with your ex if they are unable to attend. Keep a joint calendar for your child on Our Family Wizard to reduce misunderstandings or conflict. Burden the children. They do not need to be exposed to adult relationship issues. Keep a lid on any frustrations when the children are in earshot and never speak to them about your issues with your ex. Make your child the messenger or the delivery-person between you and your ex. Jump to conclusions. If you hear things from the children, discuss them maturely and calmly with your ex before flying off the handle. Go against your own house-rules. If you set up a structure, stick to it to provide your child with consistency and predictability. Engage in conversations with your ex at exchanges. Let exchanges be quick and efficient so the child can easily transition without risking witnessing tensions between you and your ex. Ask your child to be a spy and report back to you what happens at your ex’s house. This puts your child in a terrible position. The process of coparenting can be difficult and bumpy at the start but once you practice these coparenting tips you will find after a while everyone will adjust and your child can have healthy relationships with both of her parents even if you no longer live under one roof. Want to consult on parent coaching services or consultation? Please contact me and let’s discuss how I might help you.